“Suddenly I am experiencing an alarming number of customers (women so far) coming into the restaurant soaked in perfume. I’m sure they don’t understand that it detracts terribly from enjoying one’s dinner. It may be a fluke that it’s happened so often lately. There’s really no way to tactfully handle this situation without offending. Send out the word. 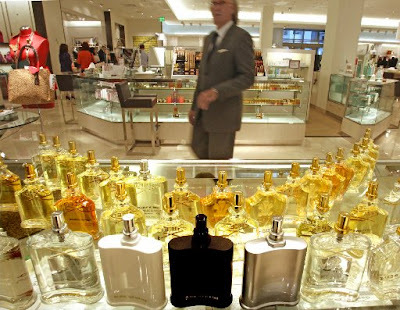 Ladies…..ease up on the fragrance!” Funny he should mention it. You should have seen the eye-rolling that went down recently when my son and I were at a kaiten restaurant and a woman sat down near us reeking of some heavy-duty perfume. “P.U.” Nate mouthed, and I couldn’t agree more. It was all we could do not to get up and move, and we probably should have. Her “lovely” scent ruined our meal. I’ll extend a hearty “a little dab’ll do ya” to the fellas, too. Which is something I always longed to (but always failed to) tell my late father, who was a big consumer of men’s cologne. So much so that when he gave me a hug, as he loved to do, I smelled like a walking perfume-counter for the next two days! Comments?